How Optus Stadium Won The Lighting Design Awards? In 2012, the Government of Western Australia had the vision to have a state-of-the-art stadium in Perth that goes beyond the emulation of world-class sporting multiplexes in Sydney and Melbourne – and gives unrivalled experience to fans and the wider smart city of Perth. The government also had the ambitious goal of having a venue that is IoT enabled with nouveau technologies that attract domestic and international events. After 5 years that went into creating a stadium that stays at the vanguard of innovative architecture and lighting, Optus Stadium was opened in January 2018 making it the largest LED illuminated multi-purpose stadium in the world. Recently, Optus Stadium popularly known as the Perth Stadium received five awards in the area of lighting design and architecture including State George Poole award and Mondoluce Lighting Design award. The stadium was also honoured with the Wallace Greenham Award for Sustainable Architecture, Jeffrey Howlett Award for Public Architecture and The COLORBOND Award for Steel Architecture. The Optus Stadium project was also shortlisted in the World Architecture Festival of 2018. Apart from its unique architecture, lighting design integrated into the Optus Stadium is the main limelight of the iconic structure. The element of light is used to create what is called the “fan-first experience to life”. All the lights and sports lights of the stadium communicate their presence in the most fun-filled and ecstatic way that elevates the moods of the fans. Optus Stadium was acknowledged with Award of Excellence WA 2018 that recognised it as an “exceptional contribution to art and science of light”. But how Optus received a distinguished global recognition is all given in the case study discussed ahead! Lighting Designer and Supplier, Philips Lighting; Architects, COX Architecture and Hassell HKS and Builder Multiplex collaborated to create the awe-inspiring Perth Stadium for the Government of Western Australia. To accomplish the set ambitious goals of the government, the lighting design team pushed the established limits of the lighting integration and created a custom-built solution for the smart city of Perth. Along with the task to design and install the lights, the design team worked in line with documentation and commissioning in collaboration with the project partners. As the stadium was built over a span of five years, the principal challenge for the entire project team was to keep pace with the continuing technological innovations. Typically, this involved working in very close partnership to evaluate designs and plans at every stage until the project reached the finish line. The result was a stadium which was built with the most sophisticated technologies so as to meet the goal of the government. Going further, the nature of the stadium was decided to be multi-functional, hosting international sporting events during the day while transforming into a function venue at night. This demanded facilities including the lighting system to be flexible for every kind of event. Going with the intention, the lighting designers planned and designed intricately thereby improving safety and architectural vision while meeting the strict code requirements. The design team developed a synchronizing lighting system that could make the entire stadium celebrate with the fans with different lighting theme for every occasion. As stated by the design team, Optus stadium celebrates with fans, from sparkling colours of the winning team to magnifying a music concert through a tailored light show. Philips Lighting bestowed the Perth stadium with 22,000 smart LED lighting making it the largest LED-lit stadium in the world. Three separate lighting systems were installed for facade, arbour and the roof halo. The facade lighting constitutes 1.5 km of RGBW lights that fitted into the facade structure, winding around the entire building. The 400 m long arbour is a pedestrian walkway that constitutes 43 individual arches and 675 RGB fixtures. The iconic halo roof is fitted with 650 Philips Colour Reach fixtures (RGB LED lighting) that illuminate the small and large PTFE panels contributing to a halo effect. 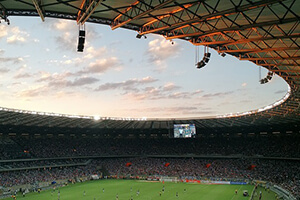 The stadium is deployed with the most advanced Philips LED lighting system that is IoT-enabled and fully connected. More than 22,000 controllable LED light fittings deployed are managed via Interact Sports lighting management software and application. The software has the capability to create a completely mesmerising lighting experience for the venue that has a capacity of 60,000 seats. Every lighting system fitted in and around the stadium is integrated through the Interact Sports dashboard including pitch lighting system, entertainment lighting around the stadium, and external architectural lighting light shows. The central dashboard is cloud-based which makes it very easy to control the stadium’s lighting system from any location and via any networked device. The lighting fitted on the roof creates spectacular light shows with patterns and imagery that can be directly managed from the Interact Sports dashboard. The software also enables blending the music and lights together so as to create visually stunning pre-match and halftime light shows. The LED floodlights obey the HDTV broadcasting standards for sports lighting. The lighting system is coordinated and maintained with the Dynalite control, networking and integration technologies. The lighting system is controlled and managed intuitively by the System Manager’s software. From the management centre things like preconfigured scene selection, channel level adjustment, and scheduling and actuating scripted tasks and events is possible. Furthermore, the software monitors the lighting system and executes maintenance functions like scheduled testing and reporting on the status of every fitting. 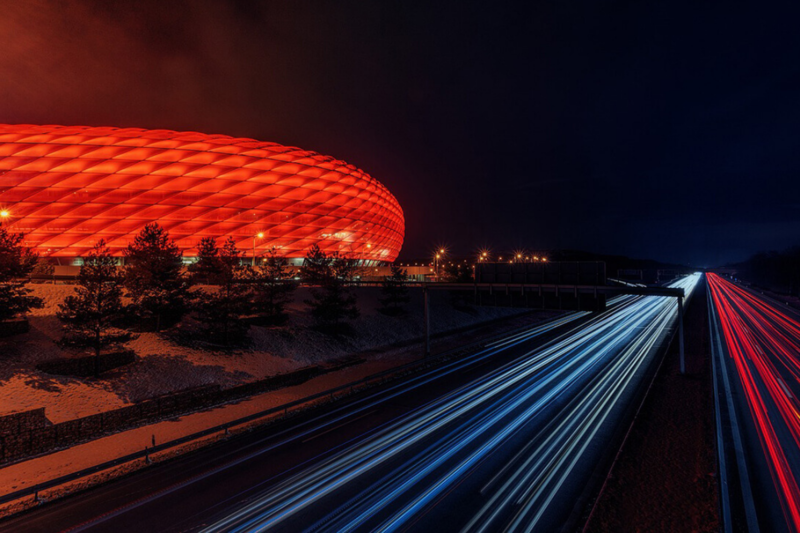 This feature, in particular, takes care of the design integrity of the LED lighting while maintaining its performance throughout the life of the stadium. In addition, 1,300 Dynalite sensors monitor the occupancy of the stadium automatically and dim or turn off the lights in areas that are unused. Holistically, the entire system along with the lighting and the integrated technologies reduces the time, increases the cost savings and eliminates the redundant maintenance work. Optus is one of the most energy efficient stadiums in accordance to the 2018 sustainability standards and ticks the boxes in many other areas of efficiency in terms of maintenance. All in all, the Optus stadium not just delivers an ultimate lighting experience for the audience but also takes care of other aspects like public safety, security and overall efficiency of event operations all year round. 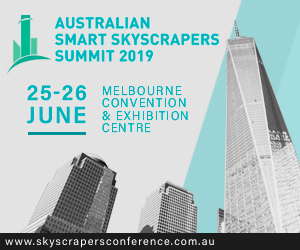 The Light-Space-Design Summit of Australia that is gearing up to take place in 2019 will talk more about the significance of lighting design in public buildings. Analysing the award-winning lighting design of the Optus Stadium and exploring the latest innovations from Philips LED technologies are one of the main topics that are going to be discussed at the event. Bruce Ramus, Founder and Creative Director of Ramus Illumination is the speaker who will highlight the specialties of the Optus stadium that can inspire others to emulate. Going further, the discussion will unlock the lighting system’s capabilities to create varying moods for visitors while switching from one event to another or in the situation from event to non-event. Visit Australia’s lighting event to get inspired by the intriguing relationship between light, space, and design. And to add more to your knowledge inbox, wait until the next blog on sustainable lighting designs.